A character’s job is a useful tool when developing a novel. I’ve been working hard on a new book this week, and since it’s a bit outside my normal genre (this one’s a science fiction detective novel), I’ve had to do a few things differently. There are elements to this genre I haven’t had to worry about in previous books. Most notably, has been how my protagonist’s job affects the rest of the plot. As a private investigator, his job is the plot, and that career choice affects pretty much everything else in the novel. In one way, this makes developing this novel easier. I have very clear parameters to work in, and a specific character type to flesh out. In another way, it adds a layer of difficulty. The most obvious and easiest path is also the most overused or even cliched. I don’t want that, even if I might want to play with the tropes and cliches a little (I can never resist this—it’s too much fun). For some novels, you won’t have much choice in the protagonist’s career. My PI novel needs a PI, and he can’t very well be a veterinarian (well, I suppose he could, but that’s a whole other story). But for stories where the hero can be anything, it’s worth taking the time to figure out the right career to serve both the character, and the tale. 1. How does the job affect the plot? What plot needs will the job fill? What skills would it allow the protagonist to plausibly have? What might put them in the right place at the right time? What type of access would it give them (such as, to a hospital, a bank, a space station)? The more job-dependent the story, the more that job will influence the plot. 2. How does the job affect the character? Who are they because of this job? Why did they choose it? Does it share hints of backstory or the character arc flaw? Does it show why they’re doing what they do in the story? Is it a source of happiness, unhappiness, or a little of both? 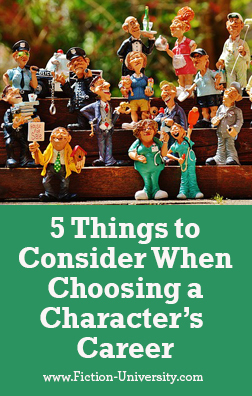 A character’s job is a great resource for internal and external conflict, so choose wisely. 3. How does the job affect the setting? Does it show aspects of the world and how the rules work? Does it allow the protagonist to interact with key elements of the setting or world? Does it offer opportunities to smoothly reveal world history or backstory? Showing a character existing and interacting with the world they live in helps you show, and not tell, that world. 4. How does the job affect the conflict? Does it create the trouble in the story or make that conflict harder? Does it create any moral or ethical problems, such as a cop who’s asked to break the law? Does it keep the protagonist from doing what needs to be done? Does it put the protagonist at risk, physically or emotionally? A job that also makes the protagonist’s life harder is a useful tool to keep conflict and tension high in a story. 5. How does the job affect the theme? Does it provide examples of how the theme works in the story? Does it represent the thing that needs to change in the protagonist? Is it an iconic image that embodies the theme, such as soldiers and sacrifice? Theme can be a tough element to develop in a story, so take advantage of the opportunity a character’s job offers. A character is more than what they do, but what they do is important to a story. 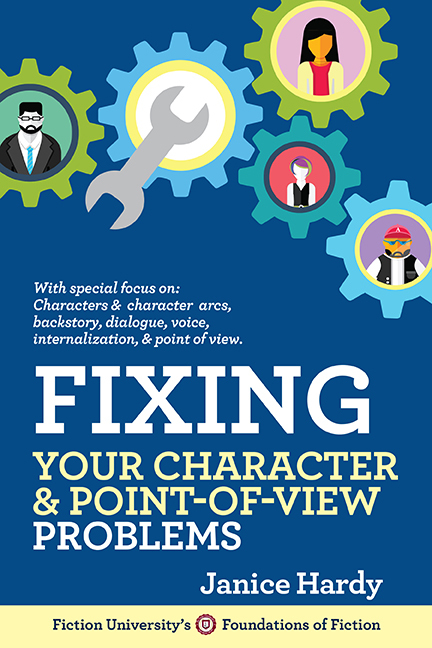 It’s another opportunity to deepen the plot, enhance the theme, or strengthen the conflicts, as well as give you plenty to draw from to show who a character is and what their problems are. Don’t just give your characters any old jobs—choose roles that suit them and your story. What does your protagonist do? How does it impact the story? Number 3. I wanted my protagonist to lose her internship at SETI's HQ before she meets the aliens. That forced the whole novel to take place in San Fransisco. Good post. My current WIP the MC's job is directly tied to the plot, but I'm toying with another idea in which the protagonist's job requires international travel, keeping him out of the loop on what's going on with his family.